One should certainly read Short Nights of the Shadow Catcher, if only for the sheer color and adventure of the story. Timothy Egan’s biography of the man responsible for most of the portraits of Native Americans we think of today as “iconic” is a wild wild west tale of the wildest kind. But it would be helpful to be armed it with a good collection of Curtis’s work by your side as you read, because while the book does include some of the photos, they are reproduced on the text paper, not glossy paper, and there are quite a few pictures Egan describes in detail that aren’t reproduced. It’s really the biography of a book…a series of books…as much as it is the biography of a man. Curtis was a man who lived in pursuit of–really, enslaved to–a vision. What he called his “big idea”; to photograph every Native American tribe in America. So it isn’t surprising that it becomes hard to disentangle the man from the work. Especially since in pursuit of the work, Curtis sacrificed many of the things we would normally look for in the biography of a man: his marriage, his career, his friends and family. 20 volumes… it staggers the imagination. Curtis original told JP Morgan, who he was hitting up to finance the project, that it would take 5 years and cost $75,000. It took more than 30 years and cost a quarter of a million, of which not a dime went to Curtis himself. Oddly enough, although this is a book about a photographer, “photography” is not the biographer’s strong point. His descriptions of the processes Curtis used — he insisted on old fashioned glass plate negatives and a variety of developing processes, some of which involved printing onto gold — are utilitarian and conscientious, but do little to bring a real “feel” for the work of the photographer to the reader. Egan is on stronger ground, though, when he talks about the photographs themselves as art, and his sense of Curtis the artist is a good one. One gets the feeling that although Egan doesn’t quite understand how to take a good picture, he knows when he is looking at one. And his grasp of how Curtis was drawn to this or that subject is very strong, beginning right at the start of the book with the story of how Curtis convinced “Princess Evangeline,” last surviving daughter of Chief Seattle, to sit for a portrait. His first Indian picture. 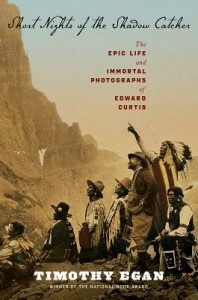 Where the book really shines, though, is in an unexpected area: Curtis the self-taught anthropologist. In order for Curtis to get some of the iconic photographs we now treasure today, he had to be accepted into the community, the tribe. And not just one tribe, but EVERY tribe he dragged his camera equipment to see. He often returned to the same tribe year after year, building his rapport with elders and medicine men and tribal leaders. He became so integrated among the Hopi he actually became a snake priest. It was the only way they’d let him watch…much less photograph, some of the rituals he wanted to document. Not many people realize that Curtis wasn’t just taking photographs. He was conducting full anthropological expeditions. He dragged around a wax-cylinder recording device and recorded songs and chants. He hired a writer and an editor and the group of them would work 16 hour days getting down vocabularies and making language notes for languages that are now lost to us today. And although his lack of a university degree meant Curtis was often looked down on in his own time by the academic echelon ensconced in places like the Smithsonian, nowadays his reputation is almost solid gold. And his 30 year mad dash around the country to document and preserve what could be preserved about what Curtis called “the Vanishing Race” is the only reason we have much of what we do know about traditional Native American life. In fact, when Native Americans began to reclaim their heritage and revive the practice of old languages, customs and rituals, they often relied on the material that Curtis had collected to help them. It’s hard not to be aware of how much might have been lost forever, if not for the great lucky chance of this one, driven man. Such a fragile thread upon which to hang the history of an entire people.